Today I’m starting a new-ish feature where I’m publishing a different thought as a twitter audio at least, and maybe a video depending on where I’m located. This first thought is on checklists, and their importance in every electrical safety program. This came to me, again, when I was meeting with a client and they were getting started developing their electrical safety program. I was there to help them with an arc flash analysis update, and we started talking about the minimum viable electrical safety program. To get there, I had to fly and I noticed something that I see every time I fly, but I haven’t thought about in a while, the pilots were doing their checklist. This was a short flight, and these pilots must do the same routine pretty much every day. They know it in and out, but the checklist helps them consiously go through all the steps every time. Its like if you drive the same part of raod often and then one day completely forget drviing it as you go though. You don’t want to space out on routine tasks. This is where the checklist comes in, with a very routine task you may skip over steps, but with a checklist you make the check as you go through, mentally remembering to do that thing. I recommend that checklists be used for all tasks that are high risk starting out, and then add in non-routine medium risk tasks as the electrical safety program matures. An example of a medium risk task may be changing a 347V ballast at height. These checklists allow the worker and manager to manage the hazards associated by those tasks, which are always medium-high risk, to make sure that everyone stays safe. Let me know what you think about this first Daily Musings. If you want to see or hear it live follow me on Twitter and Linkedin. For now I will at least do a live audio to Twitter and maybe a video on Linkedin in the future. The second to last line of defence with arc flash mitigation, according to the Hierarchy of Hazard Mitigation, is administrative controls. Administrative controls are implemented after a facility is designed and built, and equipment has been purchased and installed. What the administrative controls really boil down to is your electrical safety program. I’ll break down what that is below. An electrical safety program is a list of rules and procedures that must be followed by employees working with electrical equipment at your facility. You may already have a safety program in place, but it is important that you have a safety program that is specific to working on energized equipment. I’ve already written a series of articles to help you get started in putting together your own electrical safety program. I’ll highlight a few key parts here with arc flash mitigation in mind. There are a few major standards that need to be followed when working with energized equipment. The odds are high that you will need to adhere to one of CSA Z462 (if you’re in Canada), NFPA 70E (if you’re in the United States), or EN 50110 (if you’re just about anywhere in Europe). Broader organizations that produce standards include OSHA, IEC, IEEE, and ANSI. This is in addition to any standards specific to your location, including provincial and state regulations. These standards will have specific guidelines for performing work on electrical equipment (both energized and de-energized), covering everything from work practices to label and PPE selection. All workers should be familiar with the standards. At the very least, the standards should be readily available to read and should be reviewed prior to any job on electrical equipment. Speaking of jobs, another administrative method for arc flash mitigation is job planning meetings. These should take place before a job dealing with energized equipment begins. In general, you want to make sure to plan your jobs and schedule maintenance around the critical operations of the facility. Proper planning can include work procedures such as Lock-Out-Tag-Out. You always want to try to schedule your work so that it can be done when equipment is de-energized. An arc flash cannot occur if there is no electricity. Proper scheduling also has the double whammy effect of ensuring that maintenance on one system does not impact the operation of another system. This leads to higher operational uptime for your facility. By signing up for our newsletter, you’ll get access to a free Electrical Safety Program planning report, which covers Job Planning in greater detail. 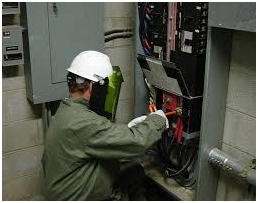 A major cause of electrical accidents, arc flash being no exception, is untrained workers wearing insufficient PPE. Well trained, well informed workers will be able to properly identify arc flash hazards and assess the risks, thereby reducing the likelihood of an arc flash incident occuring. Job specific training is mandatory before performing any new job. If the job is performed infrequently, establish a set period of time that can pass before it becomes necessary for an employee to repeat the training for that particular job. If it has been at least a year since an employee has performed a task, that employee must be trained again. Something to stress here is diligence: complacency with work can be just much of a hazard as anything else. Everyone should always be up to date on their training for any job. Another thing that workers should be aware of is clear communication in the workplace. You can find our article on clear communication here. Standards, scheduling, and training are just some administrative controls you can implement for arc flash mitigation. As always, thanks for reading! If you can’t eliminate the hazard completely, and you can’t substitute the problem areas of your system with more appropriate methods, then engineering controls are your next best bet for arc flash hazard mitigation. There are many ways that engineering design can mitigate arc flash. You could even argue that every method of arc flash mitigation falls under the category of engineering controls. Today I’ll talk about some of the big ones. To begin the process of arc flash mitigation using engineering controls, the first thing to do is a protection coordination study. A protection coordination study is an essential part of arc flash mitigation because it lets you know how your protective devices will react to a fault. The most important part of the protection coordination study tells you how long a fault will be present before a device is tripped: arc flash incident energy is reduced by reducing the amount of time the fault is active. The protection coordination study will allow you to determine whether or not you need to change the the settings of your circuit breakers and relays. This is assuming that your circuit breakers and relays are digital and adjustable. If they are not, you might want to look at substituting them for newer parts. All they’re really saying here is that you have current transformers on the low voltage side of your transformer, and when the CT’s recognize a fault they are wired to trip a breaker on the high voltage side of the transformer, protecting the entire circuit. You can find more information about maintenance switches and zone interlocking in our article on substitution. Optical relays are a relatively new concept. Instead of tripping solely based on overcurrent, optical relays sense the light generated by an arc fault and use that as another trigger for tripping. An optical relay requires both overcurrent and the light generated by an arc fault to trip: the relay will normally not trip if no overcurrent is detected (but it will trip if there is high overcurrent but not light). These optical relays can have tripping times as low as 2.5 ms! High resistance grounding limits single-line-to-ground fault currents to very low levels. These low current levels translate into low incident energy levels and therefore reduce the risk of an arc flash hazard occurring. From the IEEE Red Book (Std 141-1993, pg 367), “There is no arc flash hazard, as there is with a solidly grounded system, since the fault current is limited to approximately 5 A). You have to be careful if using this method of arc flash mitigation: high resistance grounding doesn’t mitigate arc flash in the case of line-to-line of 3-phase-to-ground faults. Some more information about how high resistance grounding pertains to arc flash can be found here. Where you put your equipment is important. Location, location, location. The location of equipment is very important. An arc flash causes rapid increases in temperature and as a result, rapid expansion of the materials that the electricity is flowing through. The explosive action of metals being vaporized and rapidly expanding is called an arc blast. Any equipment that has a high risk for arc flash should be placed in your facility in such a way that the effects of the arc flash incident are not magnified by location. For example, if an arc flash takes place in a small area, there is much less space for the energy to dissipate, and the effects of the arc flash will be concentrated. This is something that is more difficult to rectify after a facility has already been constructed, but is something to be considered during the initial design stages of any new building used to house electrical equipment. So there you have it, five different techniques to consider when looking at arc flash mitigation from an engineering controls: protection coordination studies, virtual mains, optical relays, high resistance grounding, and location. This is by no means an exhaustive list, and an important thing to remember is that your arc flash mitigation techniques will be unique to your facility by necessity. As always, thanks for reading! If you like this post but want some actionable advice, tips and information, check out ournewsletter. You can sign up here or below. Arc flash mitigation is important: to ensure the safety of a worker, every possible step must be taken to mitigate the arc flash hazard. Following the generally accepted hierarchy of controls, Elimination is the best way to mitigate an arc flash hazard. When thinking about arc flash mitigation, this is the most straightforward way to eliminate an arc flash hazard. Simply de-energize all equipment that is being worked on. Without the possibility for current to flow, an arc flash incident cannot occur. All workplace electrical safety programs should stress that de-energizing equipment before work (such as maintenance) is a necessity. In order to ensure that you your equipment remains de-energized throughout the duration of the work and is not accidentally energized, you need to have appropriate safe working practices in place. 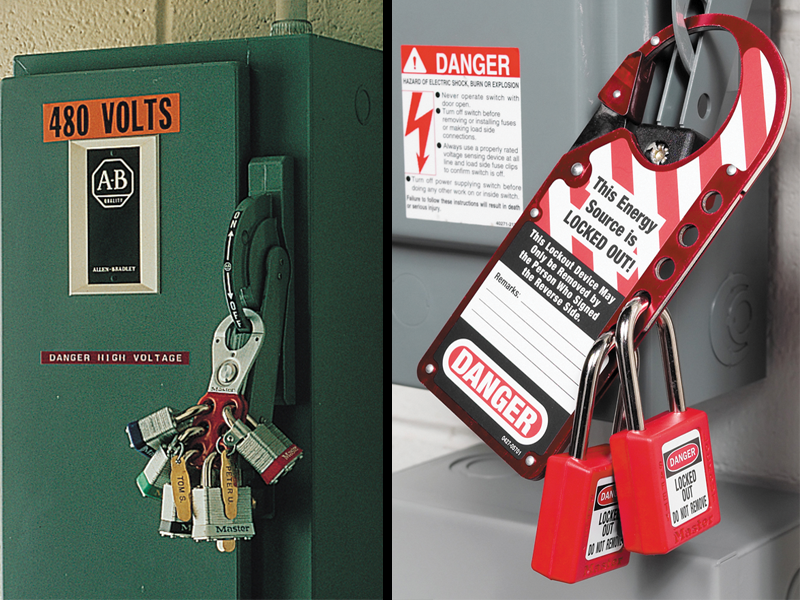 Lock-Out, Tag-Out (referred to as LOCO from here on out) is an excellent form of arc flash mitigation used to eliminate the risk of an arc flash incident occurring by ensuring that equipment remains de-energized while it is being worked on. LOCO requires that employees lock and tag the device being worked on so that it is impossible to accidentally turn the device on. The device can only be energized when all employees have removed their lock and tag and have confirmed that the device is ready to be energized again. This procedure does not work when it is necessary to perform work on energized equipment. Sensors can be added to equipment to monitor voltage, current, and temperature so that these readings can be observed on a computer instead of being observed by hand. Switchgear can be closed remotely. A remote racking system for racking circuit breakers will remove personnel from the arc flash boundary when inserting or removing breakers. The best way to execute arc flash mitigation is to eliminate the hazard all together. You can do this by making sure equipment is de-energized for work using procedures such as LOCO. When it is not possible to de-energize, you can perform as much work as possible remotely using specialized equipment like sensors or remote racking systems. As always, thanks for reading! If you enjoyed this article, sign up for our newsletter for more content like this, and share this article with your colleagues with buttons below. Until next time!